HSBC believes in the Award Concept of individual challenge : to give the youth a balanced, non-competitive programme of voluntary activities to encourage the objectives of personal discovery and growth, self-reliance, perseverance, responsibility to themselves and of service to the community. HSBC India, as a licensed operating partner of IAYP India, is steaming ahead to “Equip for Life” their young employees by introducing the Award Programme in the Technology and Services Centre nation-wide. The Award Leaders, identified Activity Coaches and Volunteers at the various HSBC Sites will provide the required guidance that will help the participants complete the Award successfully. This Pilot Project is an excellent opportunity to empower young professionals by allowing them to embark on a journey of self-discovery, add international recognition to their Resumes and prevent burn out from a high-paced work environment. An Award Leader or a Site SPOC at HSBC will monitor the entire Award Programme for all HSBC participants. Each participant will choose an activity from an already compiled list provided to them for the different sections of Service, Skill and Physical Recreation Service and share it with the Award Leader. The participant then becomes responsible to provide a detailed calendar of activities and goals to a related Activity coach for each chosen activity. The sections of Adventurous Journey and Residential Project aimed at encouraging teamwork, developing interpersonal skills and broadening a participant’s experience in an unfamiliar environment work a little differently. Participants in teams choose the purpose of an Adventurous journey and/or the nature of a Residential Project with the Award Leader. The teams then finalise the plan, embark on a journey and complete the activity under the supervision of an assigned Assessor. Every participant, after the completion of either the journey or the project is required to write a report and share individual reflections in the Diary. Participants’ Activity coaches at the site become mentors, assessors and guides of each participant’s progress to complete the Award. They will also review participants’ Diaries, maintained by every participant, in monthly meetings. Activity coaches will sign off the Record Book after the completion of Award requirements of each component. This Summit proposes the concept and implementation plan for the formation of the Gold Award Holders’ Network (GAHN), in India. Under the auspices of the NAA, the Award has experienced significant growth. More young people are now participating than ever before and an increasing number of Award Holders now have the desire to form Award Holders’ Associations (AHAs). A Gold Award Holders’ Network (GAHN) can help to link, network and synergise active Award holders all around the world so as to provide them with a platform to serve the global community and create long-lasting links amongst young people. It will also encourage existing AHAs to work more closely with their respective Zones. a. Supporting the NAA. The GAHN will be able to support the development of successful AHAs, by having good working relationships with their own Zones. The support and recognition of the GAHN by IAYP India is crucial. In return, the recognised AHAs could support their Zones in a number of ways, as successfully demonstrated by some existing Gold Holders at the NAA office. b. Sharing of best practices with NAA and AHAs. The GAHN presents opportunities to share best practices amongst the NAA and the AHAs. While noting the influences of culture on the various modus operandi, lessons learned from the different approaches can be beneficial. This open sharing will enhance the knowledge management payoff and synergistic gains of the network. c. Development of links between AHAs. The immediate payoff of the GAHN would be its linkages to facilitate and build bilateral and multilateral links among AHA members. An example could be the bilateral cooperation between the respective AHAs and NAA around the country. Many collaborative projects can transpire from these linkages at the bilateral, regional and international levels and funding may be raised via NAA or other appropriate platforms. d. Platform for representation at international events. The GAHN may give its representatives opportunities to fly the NAA flag at various regional and national platforms, such as events initiated by the IAA, the Commonwealth and the United Nations. e. Feedback Forum to NAA. With the GAHN, NAA will be able to reach out formally to recognised AHAs and be informed of any feedback or proposals from the youth. This will form an additional means of communication for Award-related matters. 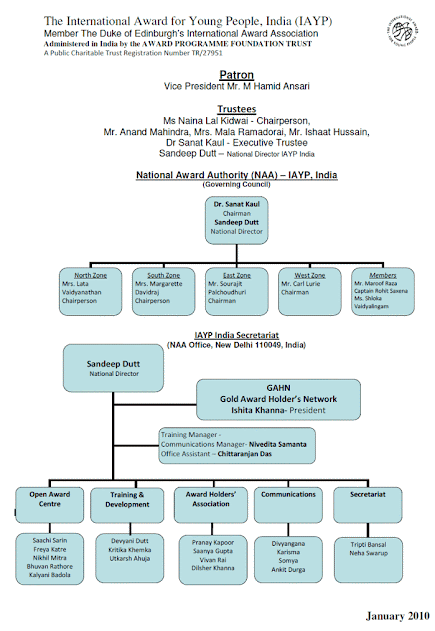 The Gold Award Holders' Society of India will assist the NAA and the IAYP India Team in the growth and development of the Award in India. Will comprise of GOLD HOLDERS only, and there will be one national body. The seven members needed to form a Society and complete the paper work will be Ishita Khanna, Tripti Bansal, Pranay Kapoor, Saachi Sarin, Sandeep Dutt, Rohit Saxena and Juzher Shaikhally. The founding team will sign the Memorandum and Articles for the Society and the registered office of the Society will be the same as the working address of IAYP India (596 Asian Games Village, New Delhi 110049). We the Gold Award Holders in India affirm to support the NAA and take ahead the programme which highlights practical experience and exceptional efforts as drivers along life’s journey and where through our programme we give young people the opportunities and confidence to keep learning, do more, and go further. This encapsulates the original vision of our founder, HRH The Duke of Edinburgh. We affirm to support the work of the AWARD PROGRAMME FOUNDATION, Administering Trust of The International Award for Young People, India (The Duke of Edinburgh’s Award) a Public Charitable Trust Reg. No. TR/27951, registered in India. Come and be involved in group work, case studies, presentations and subject matter experts on how to best engage and add value to the Award Programme. Please note that all Participating Gold Holders must bring along a copy of their certificate or any suitable proof to confirm their certification. Wear your Gold Award Badge for the first ever GAHN event. November 23, 2009 RTW begins! The Asia Pacific Regional Director of the International Award for Young People Ms. Sue Walker and her team- Delia, Peter, Rob and Katherine visited us at the IAYP National Office on November 23, 2009. They enjoyed a small presentation about the Open Awards Center and its scope of attracting the target group of youth aged 18-25 put together by Award Volunteers Nikhil and Uttarkarsh. Sue mentioned that she enjoyes the newly renovated office, the old home of Book Cafe. Many thanks to Book Cafe for moving two doors down here at the commerial complex at Shahpur Jat and generusly providing the National Office its first office space! Sue and her team took in a quick lunch prior to packing in a quick trip on the Delhi Metro to the Delhi University, with assistance from newly inducted volunteer Nivedita. The delegates from the countries of Pakistan, Australia, South Korea, Malaysia and Sri Lanka have begun arriving to the their hotel the United Services International. Much appreciation for all the planning efforts done by the entire team at IAYP Delhi. As we look forward to an entire week of training, networking and diverse participation, hopes to make the IAYP venture a successful worlwide become stronger! We, the FORUM, on this 21st Anniversary of the Association, having met from 28th to 31st October 2009 in Sydney, Australia, reaffirm our vision to be recognised as the programme of choice for young people, reflected in quality, growth and external perception. At a time in which the world is beset by a range of challenges around faith and family, the FORUM reasserted the principles and values of self-reliance, interdependence, integrity, accessibility, transparency, inclusivity and empowerment to ensure continued quality, relevance and sustainability of the Award programme within a holistic development framework. The FORUM reiterated the necessity for the Award programme to recognise the importance of supporting National Award Authorities (NAAs) through capacity building projects and facilitating links to national agendas which will inform and extend the Award programme. FORUM welcomed the opportunity to benefit from the experiences of the youth delegates. NAAs, Trustees, World Fellows, supporters, Ministers & Directors of Education, Youth and Sport and agreed that they played a valuable role in highlighting, exchanging and documenting national, regional and international experiences. The FORUM acknowledged the importance of youth perspectives and their meaningful participation in and contribution to both the governance and programmatic areas of the Award programme and agreed that the national and regional youth representatives have strategic roles to play in this regard. Presentations and discussions took into account the challenges of globalisation, changing youth culture and the need for creativity and innovation in addressing youth development through the Award programme. The need to ensure professionalism, clear and consistent values and good governance at all levels of the Association was noted. We resolve to step up the process of bringing clarity and consistency to our common purpose; fostering agents of social changes guided by the principles of self-reliance, interdependence and altruistic action, where boundaries of age, religion, gender, sexual orientation, ability, class and creed, fall away. We affirm the Award as a programme which highlights practical experience and exceptional efforts as drivers along life’s journey and where through our programme we give young people the opportunities and confidence to keep learning, do more, and go further. This encapsulates the original vision of our founder, HRH The Duke of Edinburgh. We seek further to arrive at a common understanding and communication of a programme globally recognised, widely endorsed and quality assured through the “One Award Alliance”, to which we all belong. Open Award Centre is now on! The first OPEN AWARD CENTRE (OAC) has been inaugurated successfully at the Sri Aurobindo Society , on the 5th of September 2009. 1. Orientation for the new AWARD participants. 2. Enrolment at the OAC. 3. Plan for the Award Holders Association (AHA). The meeting itself saw hoardes of participants and volunteers alike. The students and staff members of the society also attended the ceremony with abundant enthusiasm. It started with a formal introduction and a speech by the head of the society, Mrs. Daljeet Wadwa. Mr. Sandeep Dutt then officially introduced the programme to the audience. Starting with light discussion about the achievements and goals of IAYP so far, he moved on to explain the role of the programme. memories that will last you a lifetime. Why did the award come into being?? It is simply there because we want to motivate you, want you to enjoy the present moment and get rewarded for it, thereby making your life somehow more meaningful. It is presented to you not because you secured the highest position or the grand trophy but because you are showing an initiative. You come first , you receive the award .. you come last , you STILL receive the award . Because you get rewarded for doing whatever it is that you are doing , in a positive way.” Thus by captivating the crowd with his speech which was delivered in a jocund manner , he proceeded to inform the audience about the required fields of the award. programme is considered the highest accolade for an achiever. Moreover the institute members also showcased many dance pieces, plays and instrumental performance to entertain the crowd. Following this the interested candidates were registered for the programme and briefed about the coming events. All in all it was a fruitful day. We are most grateful to Ms. Daljeet Wadwa, Directos of SAIMA, for not only being our host but for assuring us of full support towards the OAC project. We are fun ,we are alive, we are young and kicking out there. I salute, all those lovely people who make IAYP what it is and what it represents for. awed by it , I’m completely overwhelmed by this whole new field which has opened out in front of my eyes. Therefore I write this, my 1st editorial, to pump up that spirit in you, Yesss u cannn do it, achieve whatever u want and desire!! The world is your playground my friends.. And there is no competition whatsoever. This newsletter has been started fundamentally to air views, exchange information and communicate between individual leaders and participants from all zones. We will make this a weekly affair to update you readers with the latest news regarding the activities taken up by the programme and the challenges encountered by those facing it. Please share pictures, news, caricatures, updates and even gossip of whatever it is that you have been doing. Send inputs about all your exciting expeditions and workshops as we have much to learn from each other. 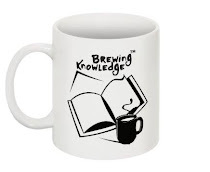 Please email to brewingknowledge@diljeeto.com and subscribe today! This is an open letter to all our Award Units and Volunteers, first to thank them for the continued support for the Award Programme, and to apprise all that IAYP India is now all set to grow from strength to strength. India is youth and youth is India! A young nation, with the largest youth force in the world, poised to make this century ours. Brand India today is the flavour of the season, the meteoric rise of the services sector and the need for knowledge capital has made India shine on the world map, and this is the opportunity for the Award Programme to build on. Not many are perhaps aware that the Award Programme in India commenced in the year 1962, and am certain near 2,00,000 lac or maybe more, have either participated or volunteered to build the programme over the years. Some say the Award Programme is perhaps the best kept secret! A conscious effort is being made by the full Award team to roll out the Development Plan 2010 – 2013, and build up to 5,00,000 participants in the near future. A big capacity building and training initiative is in the offing; the focus now is not only on the 14 -18 year olds at schools, but also on the 18 – 25 in the colleges, corporate and social organizations. We need to work with a mission to bridge the social divide and help young Indians live their dreams. The national office is now functional and the first Open Award Centre, for the college going and other youth was inaugurated at Sri Aurobindo Society in New Delhi, on the 5th of September 2009, to commemorate Teachers Day and keep the spirit of the ‘guru’ vibrant. For more and other exciting opportunities, please follow us on http://www.iayp.in/ . We are there to win hearts and partner for the spirit that keeps everyone youthful. Please share the information with volunteers and the youth. You are most welcome to drop by at our office or email Sandeep.dutt@iayp.in . Let us join hands and challenge young people everywhere! Where is the Open Award Centre in Delhi? The ROV will incorporate group work, case studies, presentations and subject matter experts on how to best engage and add value to the sections of the Award Programme. To demonstrate the Award’s usefulness to society and drive development, Participants will interact with Trainers and volunteers. The trainers for ROV trainers will be from the National Office and the Volunteers. The participants sought for ROV 2009 must be Volunteers. We are seeking participants with a demonstrated interest and/or involvement in extending the Award into the wider community to meet a higher need. The centre is equipped with the necessary equipment, landscaped outdoor facilities, an AV and training centre. All costs will be covered by the National Award Office; from noon Saturday 19th September 2009 to evening Sunday 20th September 2009. A registration fee of Rs. 100/- per delegate applies to all without any exemptions. Completed registration forms for all participants should please be returned to the National Office by 13th September 2009. Formal invitations will be provided upon receipt of completed registration forms with participant names. ASK for FORM by EMAIL please. The NAA workshop with International Support will now happen at this great venue! We are happy to work with the School and the Chinmaya family to build up the Award Programme. Workshop will commence 9th morning and end 11th evening. Details will be worked out this week. The workshop is in two parts with one session in Delhi (Role of Volunteers) – this will have 20 in all, the delegates for this will be decided by National Office. Total 30 = North, West & East will have 5 each, 5 for NAA and 10 for South. NAA 5 delegates = Director QA (Quality Assurance), One AV Team Member and three trainers. The Zones are free to decide the five participants and may need to do rail bookings ASAP. Zones to please start the search for the 5 participants in each zone. AT DELHI - more for Award Volunteers and Partners of the Award Programme. The session in Delhi (Role of Volunteers) – will have 20 in all, the delegates for this will be decided by National Office alone. Please send us your suggestions and inputs latest by the 31st of July 2009. Nominations for trainers are welcome too. 1. The first meeting of the Delhi AV Team (Award Volunteers Team) was great. Fresh faces at the Delhi University campus are surely going to make a difference to us. Three College Award Leaders appointed Mehaak at Hans Raj, Krithika at LSR and Saachi at St. Stephens. We meet again next week, and the first orientation will be at the Open Award Centre (OAC) in August 2009. OAC Delhi will be the epicentre for the college award units, and will even assist individual participants. Thanks Devyani for the initiative and am sure with you as the Award Leader, the Open Centre will be in good hands. Malini our key resource is the mentor to many of our volunteers. 2. The South Zone will host the IS supported National Workshop at Coimbatore 9-11 October 2009. The venue is Chinmaya International School. 30 participants will attend from India alone, with an observer nominated by the NAA, to monitor quality and asses impact. The Workshop is being designed by the NAA and hosted by the SZAA. One session of this workshop will be hosted by the NZAA and will be held at New Delhi. 3. As a part of capacity building and training, NAA will also do an add-on session to the Coimbatore Workshop in Delhi and focus on "Role of Volunteers". The workshop will help draft the Volunteer Management Policy. This initiative is being chaired by Mrs. Lata Vaidyanathan and Malini will help in execution please. 4. Nominations called for RTW 2009 in November, last date is 1st Sept 2009. Only two experienced participants from each Zone. For details contact the Zonal Chairperson please. 5. Proposed AHA (Award Holders Association) Summit in December 2009, send in your suggestions to Rohit Saxena please. He is our moderator on Facebook. 6. Stage set for the APF Trustees Meeting on the 22nd of July 2009 at Mumbai. 7. Facebook and the website very active, and we now have near 275 fans and friends on Facebook. 8. South Zone to host the Annual National Workshop in Ooty in January 2009. 9. in last week of July 2009, Sandeep Dutt to attend the IC Brand Task Force meeting in London. A group of 8, meeting will be chaired by The Earl himself.